Every day more and more gamers World of Tanks 1.2 replace the standard voice on the WOT alternatives. After all, no secret that well made audio support makes the game even more attractive. For quality of warfare must not only clearly see and hear what is happening around your armored car. With proper use of the sound you just hear the sound of trucks approaching ground or understand where the fire in your car. It is for this that some players are switching from the embedded version of the voice on options from the creators of the alternative sound mods. Team wotspeak.ru continuously searching for the best works and publishes them on the pages of our site. As a rule, changes are not only the sounds of shots being fired, but other world events: the destruction of the machine, damaged modules, injured crew, the sound of operation skill sixth sense and so on. before you another modification, with the help of which it will be possible to replace the stadratnye voice acting on the sound of the from World of Warship's source. Basically it's japanese voice. You liked that in the new patch while waiting for the battle music playing? If you like this modification, then this modification download and Serene Haze Sound will play the whole battle. Don't know what the stock voice acting for world of tanks? Then you have come to the right place, because Andre_V Music Pack for World of Tanks 0.9.22.0.1 represents the largest Assembly of sound mods for our favorite game. 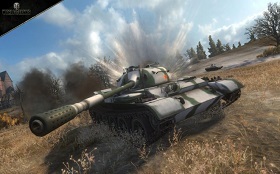 Sound mod Company of Heroes 2 for World of Tanks 0.9.22.0.1 will help you to add variety to your gameplay. Because the standard voice of many tankers have time to get bored. This version contains more than 300 different phrases that fully match the meaning of all the actions of the crew in the game. Real sounds of engines tanks. Now you can supply them yourself and enjoy the roar of the engine of his beloved tank. Steel Foxes — English voice acting for World of Tanks 0.9.16 from the Studio Strategic Music. This is another creation of the famous Studio. Previously they created not a little in love with the popular crew. They are all very popular even now. Well, what here to be surprised, Strategic Music is a well - known firm voice acting for the games and everything they do is a masterpiece. Dear friends! Team players AGQJ offers you sound modification of almost all the sounds in the game World of Tanks — the sound modes "AGQJ Sound Mod". This sound mod makes the game atmosphere more intense, emphasizes the energetic pace of the game and allows you to look at World of Tanks in a new way! Great mod to replace the game all the sounds of the guns, the sounds of flying artillery shells and more.